Asking DH if I could go to the Monthy Spin-In the Sunday after he’d got back from being stranded for five days by an Ash Cloud was “milking-it”, let’s be straight about it. My account with the Brownie Points Depository was bursting at the seams and I was making a withdrawal. I didn’t quite say: “You see those three crazies and that mini-mountain of laundry? They’re all yours! See you in a few hours.” But I might as well have! I think it might be a bit painful for other spinners to watch me in action. I’m not… shall we say… graceful. Also, possibly my concentration-face looks akin to another person’s “I’m in pain”-face. A few other spinners expressed their concerns for my well-being and hinted at a less-than peaceful mental health – albeit, very gently and with a willingness to assist. In fact, I felt very much at ease and enjoyed myself immensely. In particular, I’m very proud about what I’ve produced. 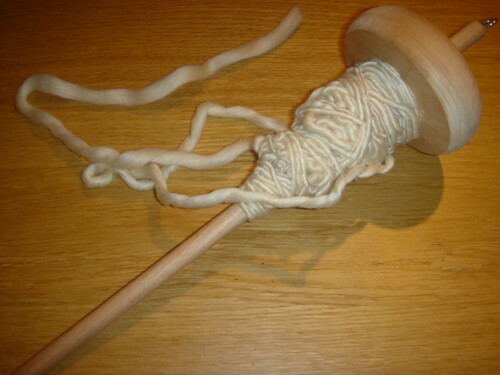 It’s fairly even, doesn’t have too many rogue pieces of fluff from other spinners or floor-pickings and seems to be a worsted weight (as opposed to the lace-weight / bulky I produced last time). 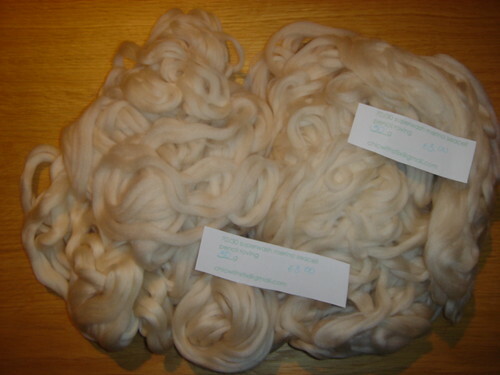 I realise it helped that I was using pencil roving; and that it was undyed – that was my plan. By cutting out the pre-drafting part of the process, I could focus on practicing getting the twist in (without taking an eye out!). I still have the second bag to spin. When I do, I plan to dye each single the same colour but separately: one in a dye for wool, and the other in a dye for Tencel. I know the Tencel will take some of the wool dye but I’m interested in seeing how the blends react. Then, I will ply them and hopefully end up with something that is nicely blended.